My hummingbird imagery symbolises the unseen and intangible in our world. Just because we can’t see or touch something doesn’t mean it’s not there or is having a profound effect on our lives. The Aboriginals, Native Americans and many other indigenous peoples around the globe have a deep understanding of our spiritual, physical, social and cultural connection to the land. They believe all of life as it is today, human, animal, bird and fish is part of one vast unchanging network of relationships. They understand fully the importance of land management care towards our health and overall wellbeing. It seems that many people today, young and old from all sectors of society, are experiencing physical and emotional illnesses and distress. Given our fast pace of life and that so much of the world’s population is now plugged into technology of one kind or another, is it any wonder that our collective senses are being deadened? Technology has changed the whole world dynamic. In this fast watercolour sketch from Portugal last October, everything within the image is interconnected. There are no starts and stops…no beginning and no ending, rather a continual flow. Feeding our senses by spending time in the natural world, is healing. However, like all good medicine, it needs to be enjoyed on a consistent basis. Many have forgotten the simple pleasure of sitting beneath a tree and how restorative it is. I have been listening to a radio programme about the power of the placebo…and how it has been shown time and time again to cause a sense of wellbeing even though the recipient is fully aware that they are taking a sugar pill. This has everything to do with mind, body connection. This photograph was taken on a hot day last October on my friend’s farm in Portugal. I had just finished teaching a course and needed time to relax, focus and meditate. Once I began to sketch and most importantly open my senses to all that surrounded me, within minutes I felt calm and refreshed. When we immerse ourselves into the creative flow, our minds are taken into what I call deep time. A place that is totally different from our clock watching, rushing to the next appointment type of time. An intangible sense of calmness and wellbeing ensues. We return to what we were designed for – being part of nature and engaging our senses. Portugese children on Armona Island playing with shells…. Trying to exist in this brave new world and finding a space for creativity, in all its many forms….might sound impossible. I have raised a family and worked all my life and like most people have lived through some very stressful times. I have learned that if I simply stop….and give myself some soul food each day, I am immediately calmed and feel a sense of well being. Soul food time enriches and supports everything else we need and have to do in life. It costs nothing. It doesn’t mean major life changes. It simply means addressing the part of ourselves that is in desperate need for daily food. One hugely important factor so often overlooked is that of populations growth. I was born in London in 1946, right after World War 2. At that time the world population was approximately two and a half million. Today the world population is seven and half million and rapidly rising. This tells me that more than ever before we need daily soul food and to renew our connection with the natural world. If we don’t give ourselves this precious time, we are doomed to be like hamsters running around a wheel…..feeling utterly frustrated and exhausted, and at the same time achieving very little. I made this quick sketch when visiting my son and his partner on their farm in Pennsylvania last spring. Their neighbours are Amish. We have much to learn from such people. From Buddhist Offerings…. http://www.janetweightreed.co.uk – The Apple Exercise. I have just re-read Virginia Woolf’s – A Room of One’s Own. It has been at least forty years since I last read it. Back then it didn’t resonate with me in the way it does today. . This entry was posted in Uncategorized and tagged a concentrated mind, Aboriginal dreamtime, aboriginals, alternative healing, amish people, art in the algarve, Buddhist Offerings, communing with Mother Nature, deep time, Dreamtime, embracing unvertainty, intangible healing, magical hummingbirds, making a living as an artist, mind body connection, native americans, necessary solitude, Refusing interruptions, soul food, total interconnecton, Virginia Woolf, welcome solitude, world population explosiobn on February 19, 2019 by janetweightreed10. September – new beginnings and a time of renewal. Moving from August into September has always meant new beginnings for me. Along with the onset of cooler weather and visible changes in nature….there is also a perceptible change in mood. Children go back to school and many return to work. The world around us becomes busier. I am speaking from an English point of view. For my friends living in the southern hemisphere….there are also new beginnings – for them Spring is arriving. Those who follow this blog will be aware that I usually go to Portugal in April. This year, I am also returning on 18th September for a workshop at the school in Olhao http://www.artinthealgarve.com The School is one of my all time favourite venues – a wonderful places to explore the creative process. Olhão Portugal – http://www.artinthealgarve.com – watercolour After working with a group for the first week, fellow artist and good friend Bonnie Halsey Dutton http://www.bonniehalseydutton.com arrives from South Dakota to give a course. As always we take these opportunities to spend some time together. I will also see another artist friend, Vickie Snaddon, who has a house not far from Olhao. It is Vickie who runs the beautiful lodge in Belize http://www.pookehilllodge.com Needless to say, I am really looking forward to it. Nesting storks on one of the local churches. I With its courtyards, communal areas and excellent studio space, plus shops, cafes, markets, Lagoon all within a few minutes walk from the school – plus of course the wonderful Margarida and Joanna who take care of all our needs….what more could an anyone wish for. Another exciting development this year is that I have been invited to exhibit five watercolours at the Chongqing Museum of Art, China. This is part of a French/Chinese annual cultural exchange. I was invited by French artist Claude Lesur who organised an exhibition I had in France eleven years ago. The opening in Chongqing will be on 17th November and next spring the exhibition will come to Paris. I will write more about this after I return from Portugal. The Art Gallery in Chongqing where the exhibition will be held. This has been one of the best years I can remember. I have visited places, friends and family I love and along the way enjoyed wonderful conversations and much laughter. I am so grateful for this moment in time and that I have been able to focus on what is truly of value in my life. This entry was posted in Uncategorized and tagged art in the algarve, bonnie halsey dutton, Buddhist Offerings, Chongqing museum of art China, Claude Lesur artist france, http://www.artinthealgarve.com, http://www.bonniehalseydutton.com, http://www.janetweightreed.co.uk, http://www.pookshilllodge.com, HummingbirdHQ.com, magical hummingbirds, new beginnings, olhao portugal, Ria formosa national park, southern hemisphere, spearfish south dakota, vickie sadden artist, Vickie Snaddon artist on September 4, 2018 by janetweightreed10. It’s been quite a tumultuous time within my own personal sphere. Having buried my Mother last December, – my dear Aunt Peggy moved on to be with the magical hummingbirds this month. Her funeral last Thursday was a celebration of her remarkable life. I have also lost two other friends……………all of which has caused much reflection. Our time on this precious planet is fleeting. – we must never forget this. I posted these two photographs of my wonderful Grandmother and her Great Granddaughter, my daughter, because they show so clearly that within a relatively short period of time…..how our world has changed. How the lives of women have changed…..
My Grandmother, born before the two Great Wars….served in WW1 as a VAD nurse, – it is also during that war she met my grandfather, Between the wars, she had four children, and was involved with the women’s suffrage movement in the UK. Her daughters, my Mother and Aunt – served during WW11 both in the VAD as nurses. One son was an army man and the other on the Russian Convoys. I was most fortunate to have her in my life until 1972. I was able to spend much meaningful time with her, for which I will be forever grateful. I gave Christie her middle name after my Grandmother. A magical hummingbird drinking from the sweet nectar of life…………………….. When I went through my Aunt’s papers, I was delighted to find that her passport only expired last year – which means that she renewed it when she was 86. She also volunteered helping ‘old people’ when she was in her eighties and early nineties. What an inspiration. It is the influence of these women, including my daughter, that has given me courage to move forward when times haven’t always been easy – and I know that they will be there for me until I move onto the next adventure…….. I read this somewhere, and believe it to be true. The beauty of collaboration between older and younger generations is that we combine strength with wisdom. It will take a while before I get into a flow. I plan to catch up with comments etc. over the next two weeks and then I go to The Magical Town of Crickadoon for some R & R and of course painting. And so my friends, I will now move forward with a sense of purpose and joy. This entry was posted in Uncategorized and tagged Buddhist Offerings, HummingbirdHQ.com, life and death, magical town of crickadoon, magicalhummingbirds, moving forward with lightness of spirit, spanning generations, The two great Wars, VAD, Voluntary Aid Detachment, Women's suffrage movement, Womens rights on August 1, 2017 by janetweightreed10. There are two basic motivating forces: fear and love. “When we are afraid, we pull back from life. When we are in love, we open to all that life has to offer with passion, excitement and acceptance. We need to learn to love ourselves first, in all our glory and imperfections. If we cannot love ourselves, we cannot fully open to our ability to love others or our potential to create. Evolution and all hopes for a better world rest in the fearlessness and open hearted vision of people who embrace life.” John Lennon. watercolour/gouache All of life in interconnected. Mother Nature and the Magical Hummingbirds remind us of this as they work together rather than in opposition. watercolour/gouache Most cultures teach us that safety is found in separation and disconnection. If we really believe that what happens in one part of the world doesn’t affect the rest of the world, we are in fact living in denial, convincing ourselves that we are safe. To rely on disconnection for protection is to rely on falsehood. watercolour/gouache Mother Nature has given us the perfect example of what happens when we respect the laws of interconnection and also what happens when we don’t……..
You menace others with your deadly fangs but in tormenting them, you are only torturing yourselves. This entry was posted in Uncategorized and tagged all of life is interconnected, Buddhist Offerings, fear and love, janet weight reed magical hummingbird watercolours, john lennon, magical hummingbirds, mother nature., separation and disconnection on May 25, 2017 by janetweightreed10. 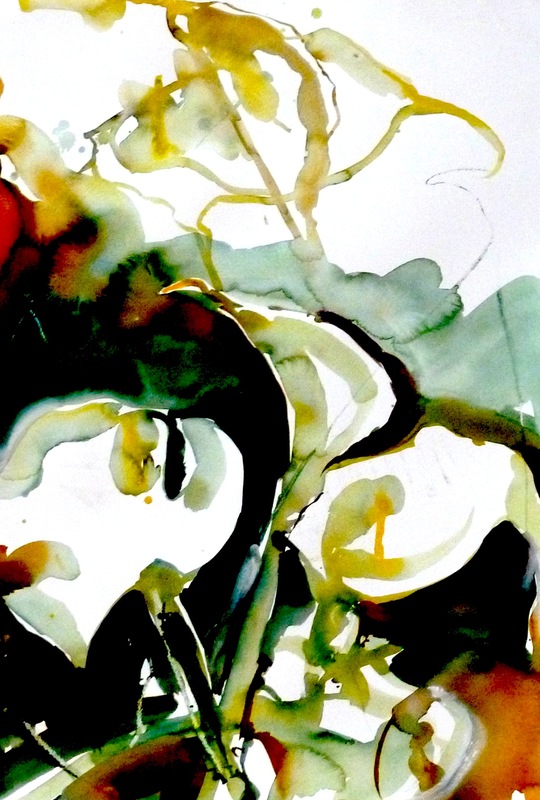 Rapid watercolour – Magical Hummingbird with Cala Lilies. This entry was posted in Uncategorized and tagged Buddhist Offerings, everything constantly changes, magical hummingbird with calla lilies, nothing is permanent on January 6, 2016 by janetweightreed10. Rapid watercolour/felt tip pen – The moon, mountains & magical hummingbird. ‘Let us try to recognise the precious nature of each day’. The 14th Dali Lama. I was given the book, ‘Buddhist Offerings 365 Days’ ten years ago on my 60th birthday. Each and every day it offers words of comfort and wisdom. This entry was posted in Uncategorized and tagged Buddhist Offerings, moon mountains and magical hummingbird, rapid wtercolours, the 14th Dali Lama on January 5, 2016 by janetweightreed10. It is our mind, and that alone, that chains us or sets us free. It is our mind, and that alone, that chains us or sets us free. Buddhist Offerings. This entry was posted in Uncategorized and tagged Buddhist Offerings, cala lillies, rapid watercolours, spontaneous watercolour painting, watercolour demonstration on August 24, 2015 by janetweightreed10.